Panasonic eneloop rechargeable batteries are an excellent choice for applications requiring reliability, high performance, long life and eco-friendly batteries. Eneloop batteries can be recharged up to 2,100 times, saving money on purchasing new batteries, and reducing waste of discarded used batteries. Eneloop batteries are useful in applications such as clocks, toys, remote controllers, digital cameras, flashlights, smoke alarms, two-way emergency radios, emergency AM/FM/weather radios, and other electronic devices. These batteries have a low self-discharge rate and maintain a charge for a long time. After 1 year: 90%, after 3 years: 80% and after 5 years: 70% of full charge remains. Very important when you need a flashlight or radio in an emergency, after several years in storage. Many rechargeable batteries do not hold a charge for more than 2 years. Have you ever needed a flashlight or radio and found the batteries were dead? Eneloop AA size batteries (BK-3MCC) store up to 2,000 mAh. Eneloop AAA size batteries (BK-4MCC) store up to 800 mAh. Adapters are available for using AA batteries in devices requiring C or D size batteries. Part numbers shown are for the current 4th generation enerloop technology. Sanyo, was the original developer of the battery technology in 2005. Panasonic acquired Sanyo and has continued to improve the technology. Digital cameras using eneloop batteries can take about 4.4 times more photos than cameras using standard alkaline batteries. Eneloop batteries also maintain high performance in low temperatures for cold weather use, including cold climates, skiing, hunting, camping, security and law enforcement, down to -4 degrees Fahrenheit. Dry cell batteries, such as alkaline, have a nominal voltage of 1.5 volts. Eneloop batteries use nickel-metal hydride (Ni-MH) technology, with a nominal voltage of 1.2 volts. Most devices will work with either type of battery. As a dry cell battery ages, its output voltage drops rapidly. With eneloop batteries, the output voltage remains constant until near its end of life. I use small, portable solar panels to recharge my radios and solar battery packs. The solar panels recharge the batteries installed in the radios. In an extended power outage, the solar panels can provide power during the day, and the batteries can provide power at night. Panasonic recommends using a Panasonic eneloop battery charger. 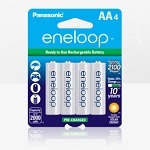 I use and recommend Panasonic eneloop rechargeable batteries for everyday use and emergency use. Note: Also see my blog posts on the Kaito KA360 AM/FM/weather emergency solar radio and the Cobra CXT545 28-Mile Two-Way Radio.